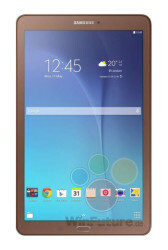 The Samsung Galaxy Tab E 9.6 refuses to stay under wraps. 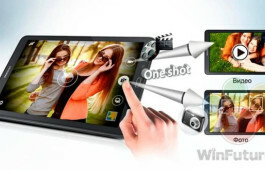 This time a number of promotional images of the upcoming affordable tablet leaked, along with some additional specs. 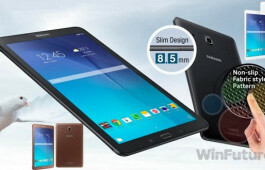 The tablet will come in two versions – Wi-Fi only and 3G (no LTE it seems). These will allegedly be priced at €180 and €200 respectively, though that seems high going by the specs. 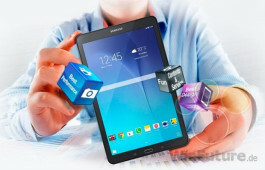 The tablet packs a 1,280 x 800px screen or (1,280 x 768px, not clear). 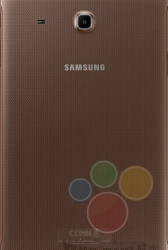 It's powered by a Spreadtrum SC7730SE chipset with a quad-core Cortex-A7 at 1.3GHz, 1.5GB RAM and Mali-400MP4 GPU. 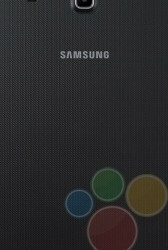 Not greatly impressive, but at least you get support for up to 128GB microSD cards. 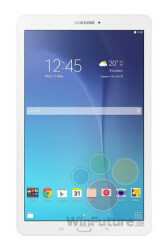 The Galaxy Tab E 9.6 may launch with Android 4.4 KitKat, despite suggestions of 5.0 Lollipop. Either way, promo images show split-screen multitasking and a Microsoft Office package pre-installed. The tablet will be 8.5mm thick, respectable for an affordable device, and feature a grippy, fabric-like pattern on the back. The camera on the back is a 5MP shooter, the seflie camera works at 2MP. 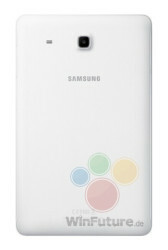 For connectivity there will be Wi-Fi b/g/n, Bluetooth 4.0 and optional 3G HSPA. The battery is said to be a smallish 5,000mAh unit.